This is an important dish for me. Its one of the first curries I learnt to make, from an old and battered Madhur Jaffrey book. I used to make it in my mum’s kitchen, and we’d eat it outside on the old wooden table, the one with the benches, in the sun, by the hedge that hid a nest of benign wasps. 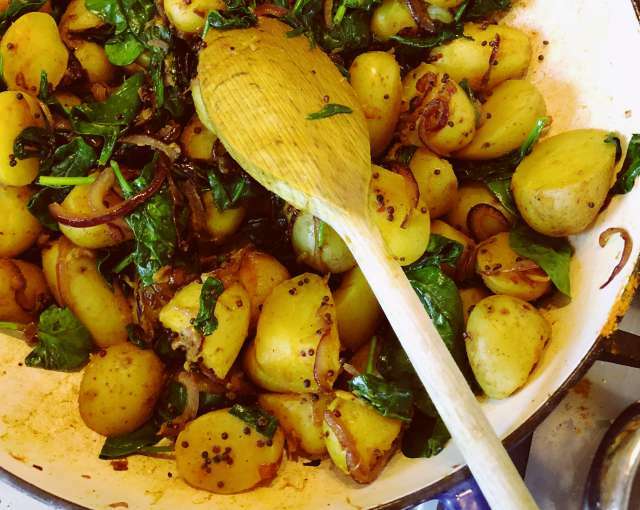 Saag aloo is a glorious thing, a simple dish of potato, onion and spinach. My version has evolved over the many years I’ve cooked it. It’s become more refined and less blunt, crisper and cleaner of flavour, more architectural. I’ve toyed with the potato variety, and settled on the waxier end of the spectrum, cooking them on their own before adding them to fried onions and spices to soak up the flavour quickly and sharply. The spinach is now the last stage, where it started as the first, fresh and no longer frozen, all the better to cling onto that tang of bitterness. I cook this dish by sight. There is no recipe anymore, and all measurements are instinctive and approximate. It doesn’t matter, for this is a curry that bends readily to your whims. Everything needs to be prepped first for this. It’s a dish that has a couple of different strands going on that all converge together quickly and easily at the end. Start with the potatoes. Take a kilo or so of small, waxy potatoes, chopped in half, and boil them gently in salted water until just tender, drain and set aside. The next step is the most important, and it sets the tone for the whole dish. This is the thing you’ll see at the start and taste at the end. Heat a tablespoon of ghee or vegetable oil in a large pan and when it’s hot, add a generous tablespoon or more of mustard seeds. They’ll pop and spit almost immediately, flavouring the ghee. Follow the seeds with a finely chopped red onion and a couple of sliced cloves of garlic. The onions will cool the pan – help it by turning the heat down a fraction and let the onions soften gently without colouring. After a few minutes, add a teaspoon of turmeric and a quarter teaspoon of chilli powder. Stir briefly and add the potatoes and some salt and black pepper to taste. Stir and turn the potatoes and onions together to coat everything in the spices, and add spinach, several good, big handfuls. The pan will overflow, but the leaves will wilt quickly and melt into the potatoes. Stir and turn so that everything mixes and heats through, and serve with a dhal, rice or naan breads. The battered Madhur Jaffrey book from which the idea for this dish came is Madhur Jaffrey’s Indian Cookery, which you can pick up for pennies secondhand on Amazon, but really, any Madhur Jaffrey book is a book worth buying. I particularly like The Ultimate Curry Bible and The Essential Madhur Jaffrey.